The Web Console will open when the first guest or the host dials in. As your guests dial in to the call, you can input their names so you can identify who is speaking and when. Simply click the pen icon under 'Name', it will allow you to add the name of your guest. If you have a noisy line coming from your conference you can mute it by pressing the button that looks like a speaker, you can identify this line quite easily as under the ‘Talker’ column there will be an X. If you would like to hang up a specific line that is dialled into your conference you can do this by pressing the ‘drop’ selection, this will hang up that particular line and lock your conference so they cannot dial in again. 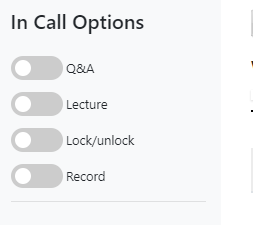 You can place a participant on hold with the pause icon if there are aspects of the conference that are not relevant to certain participants and let them re-enter when necessary. As your guests dial in to the call you can input their names so you can identify who is speaking and when by clicking the pen icon it will allow you add the name of your guest instead of the number they dialled in with. 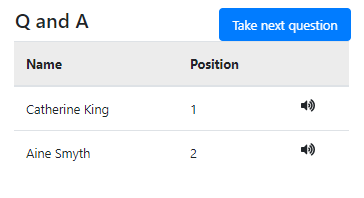 By turning on Q&A mode in the Web Console you will be able to view a list of participants in the order of when they dialled *1 on their keypad (Command to ask a question). If you wish you can take questions in the order you want simply by clicking on that person's name in the Q&A box. By enabling lecture mode on your conference it will automatically mute all guest lines, if the conference is information-rich you may benefit from this feature, if a participant needs to speak at any time they can dial *6 on their keypad, and when they are finished speaking they can dial *6 again, or you can also mute their line within the web console. If you want to add an extra security layer to your conference call and are satisfied all participants needed are in your conference, you can turn the lock feature on. This means that anyone that dials in after you have turned the Lock Mode on will not gain access to the conference. By clicking this selection again you will be able to unlock your conference call. If you want to record your conference call, you can enable this feature, it will record the conference from the moment you enabled it. The recording will be available after your call in the ‘Recordings’ section on ‘MyAdmin’ in Mp3 format which you can distribute to people who may not have been able to attend. At the end of your conference call, select the ‘Hang all up’ button to disconnect each person from the conference. Set Lecture Mode by Default.